Your annual membership comes with a colorful Enlightened Warrior Society Light Warrior Membership Certificate suitable for framing, and the exquisite Enlightened Warrior Wheel of Light Patch that looks great on a hat or a jacket. People will stop and ask you where you got such a beautiful patch! Become a recognized member in good standing and support the vision! 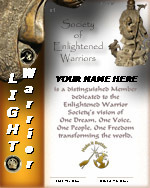 Click the button below to add the LIGHT WARRIOR MEMBERSHIP to your wish list.